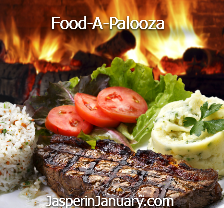 Jasper in January 2016 celebrates the third annual Food-A-Palooza. Jasper's Townsite Restaurants will be brewing with mouth-watering menus. 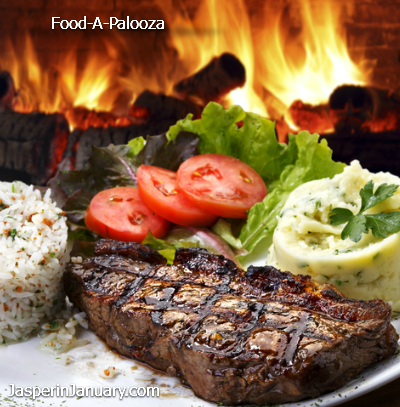 Food-A-Palooza is a culinary "crawl" to compliment a weekend of traditional Jasper in January events such as Mountain Park Lodge's "Chili Cook Off", Sawridge's "Hops and Scotch" and Jasper's Progressive Dinner. Burger Trio served with matchstick french fries. » Paired with Aperol Negroni, a perfect combination of Plymouth Gin, Aperol & sweet vermouth. Canadian maple & brown sugar cured Atlantic salmon. Hickory potato cake, lemon & horseradish whip cream. » Paired with a glass of Canadian Red Rooster HenHouse white blend. » A basket of crispy sweet potato fries, perfect for sharing. » A Saskatoon berry chocolate mousse, house-made granola and dark chocolate bark. 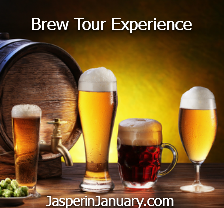 » Paired with a Jasper brewed winter Chocolate Porter. » Salmon, chipotle aioli, red onion and cilantro on toasted baguette. » Paired with our signature Nothern Lights cocktail. » Fresh mozzarella baked bruscshetta; house marinara, herbed coulis, and asiago cheese. » Paired with San Felice Il Grigio Chianti Classico. » Leroy's Crispy Dry Ribs - Earls famous dry ribs, savoury and seasoned with coarse salt and black pepper. » Paired with Mon Ami Rascal Grenache Syrah Mouvedre or Viognier/Marsanne, France. » Baked brie topped with maple syrup and walnuts on a crostini with basil oil and a balsamic reduction. » Paired with Muscadet Sevre et Maine Sur Lie. » Duck confit wings with a sweet and sour sauce and honey mustard wings. » Paired with an Alley Kat beer. » In-house made, oven baked thick potato chips with thinly sliced AAA Alberta beef and roasted red pepper relish. » Paired with Kenwood Zinfandel. » Braised pork riblets in a hoisin glaze with house smoked coleslaw. » Paired with Errazuriz Max Reserva Cabernet Sauvignion. » Meadow Creek Farms organic chicken mousse stuffed mushroom caps with scallions and a chicken garlic glaze. » Paired with Gehringer Dry Riesling. » Bourbon marinated Meadow Creek Farms organic pulled pork spring roll - Embers signature BBQ sauce. » Paired with a Lynchburg Lemonade. A Jasper in January classic favorite! Fantastic local, original chili recipes by competing teams themed and in costume. 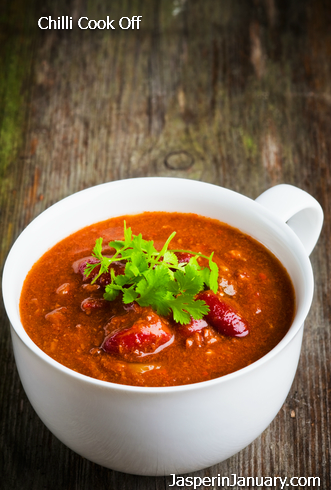 This 28-year-old chili cooking content contest requires teams to make the best chili from scratch. 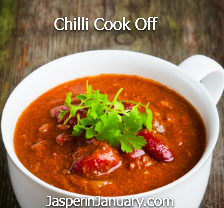 » The chili judges determine that no ingredients can be pre-cooked or chopped prior to the start. » To make things a little more challenging - no beans are allowed. Competitors often entertain spectators by donning costumes and there have been a variety of creative themes in the past. The Chili Cook off event sells out fast. Years of working with colour, design and varied applications within the advertising field have laid a solid groundwork for John's painting. With a principle focus on portraiture, he seems to consistently capture the essence of the personalities he paints. With a style that varies from flat application of colour to vibrant knife painting and use of mixed media, he continues to grow in style and confidence with each new work. Allan began carving stone in the late 90's, he is self-taught, working primarily in chlorite, alabaster and soapstone, using a variety of tools and techniques he has developed many unique applications to perfect his work. He continues to evolve that talent, refine his work and generously share his knowledge. » Mountain Galleries, Fairmont Jasper Park Lodge. Carving a Bear Demonstration is FREE to observe. Do you embrace winter, hibernate indoors or fly south? 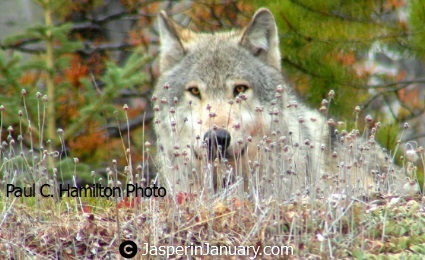 Find out how different animals of the park adapt to winter. If conditions are right, the program will be a gentle snowshoe hike (snowshoes provided), if not we will adapt the program to the weather. Learn a few outdoor winter skills, like how to start a fire with flint and steel using natural materials, then cook your own bannock on a stick for a tasty treat. 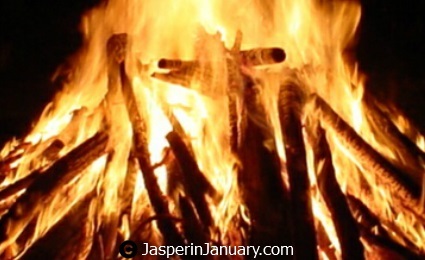 This Jasper in January 2016 site is brought to you by Proud Canadian Volunteers interested in the Preservation and enjoyment of Canada's National Parks. Reasonable effort is made to supply Jasper in January 2016 data, but errors and ommissions can result.